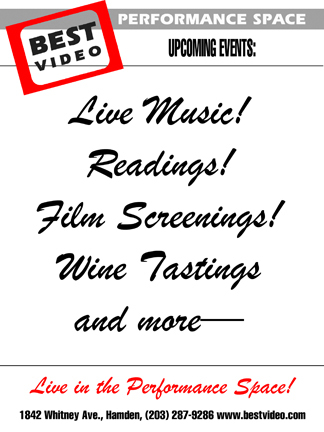 A new jazz trio, Bamjam, play Best Video Performance Space on Thursday, July 19. The show starts at 8 PM and the cover is $10. 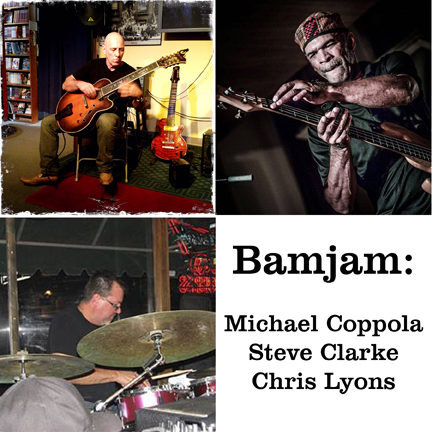 Bamjam is a vehicle for guitarist Michael Coppola’s “original, funky bluesy jazz tunes.” The music draws elements of Jazz, Blues, and Funk, with groove being laid down by Steve Clarke on bass and Chris Lyons on drums. Coppola, who leads an open jazz jam each month at Café Nine will be demonstrating a whole other side of his playing, much more in the realm of Jeff Beck music, rather than the straight ahead jazz one would expect to hear from him. He riffs on 9-string guitar with distortion; it’s not to be missed. Chris Lyons cut his musical teeth as a teen under the tutelage of Guitar George Baker, who recognized the innate groove in this young drummer. Chris went on to play with greats such as Mark Egan, Jeff Andrews and many more. Steve Clarke has been the most in demand electric bassist in Southern CT for years. Known for his funk and jazz chops, Steve has performed at numerous festivals and venues worldwide, with the likes of Mike Stern and Laco Deczi as well as R&B artists such as The Drifters, Mary Wells and the Coasters. Michael Coppola has performed at venues such as the Montreal Jazz festival and the Namm show, as well as well known NYC clubs such as the Blue Note, The Iridium and Knickerbocker. He has played with artists such as Les Paul, Tommy Emmanuel.